Another tournament featuring England, another premature exit. The Under-21s are preparing to fly home from the Czech Republic after a comprehensive defeat to Italy. Henry Winter: Would love to see more young English players go abroad, develop as players and people, taking more responsibility. But more money at home. Chris Painter: Gareth Southgate can't fault their application? Really? So he asked them to play like that did he? Dreadful night for English football. Steven Gordon: So after the U21s performance and 2014 World Cup can I ask - did 1966 actually happen, or is it like the Easter bunny and tooth fairy? "People frightened of telling players off"
"Some of these kids are millionaires and people are frightened to death of telling anyone off. They could go to their agents and tell them. For goodness sake we have to get over that." Sam Wallace: U21s out in last 8, proving we really are quarter-final level country at best. Likes of Denmark, pop 5.6m, showing us how it should be done. "Most of the Under-21 side nowhere near England senior team"
"Take out Harry Kane and John Stones, do we think any of those players will be near the senior team? Nowhere near." Kevin Mousley: We have a walkover Euro 2016 group - if winning something is vital why not pick Sterling, Wilshere et al for Under-21s - mad. Don Fleming: Too many overseas players while our young lads warm the subs bench and are totally unaware of the intensity of top-flight football. Paul Mulligan: Terrible from England Under-21s. Team full of skill and talent stifled by poor tactics. Just had to get the ball to Harry Kane - simple. England manager Gareth Southgate, speaking to BT Sport: "I can't fault their attitude, application. They have been a tremendous group and they are hurting." England goalkeeper Jack Butland, speaking to BT Sport: "This was completely avoidable, stuff we knew they would do. Italy are crafty and lively, we played better football between the boxes but you can't excuse that at either end. "You have to be at it all day. It doesn't matter how well you prepare you have to be able to bring it when needed." "England have been passing for passing sake. All they are doing is allowing the opposition to get behind the ball." Former Tottenham manager David Pleat on BBC Radio 5 Live: "I would like to see English clubs going back to how we used to play with two strikers. We have gone too much the foreign way with one up front and two behind." Alex Haworth: Another group stage exit, another media post mortem. Getting a bit boring isn't it? "Why has this happened again?" "What can you say? Coming into this tournament there was a genuine sense that this might be different. England began as second favourites behind Germany. And yet they finish bottom of the group with one win and two goals. So much disappointment in Olomouc and now the question 'why has this happened again' is going to be asked. Not sure what the answer is. And I think that is perhaps the biggest problem." Alan Vaughan: How can we hope to win if we don't select the best players? If Under-21 players say they won't play then they shouldn't play for the senior England team. Matthew Wearmouth: 140 characters is nowhere near enough for me to express my displeasure at that England U-21 performance. Pathetic display. Sean: Our game is going down the toilet. If I was Nathaniel Chalobah and others, I'd seek top flight football abroad, not getting it at Chelsea. Former Tottenham manager David Pleat on BBC Radio 5 live: "I'm disappointed we have gone out. We haven't done well, our best creative players were not there. "We have a phase between a player hitting the team and then there is a stoppage, they are not moving on." "Another day to forget for English football. Out-thought, out-fought. Pre-tournament optimism replaced by a sobering dose of reality." England have not been helped by injuries to West Brom striker Saido Berahino and Tottenham's Alex Pritchard. But to finish bottom of the group again? "It was a sad, sorry, state of affairs for England. They were well beaten." Former England keeper David James on BT Sport says England have not been good enough in the Czech Republic. "I came into this tournament with belief they could win it," he adds. England are out and finish bottom of Group B. Another tournament comes to a premature end. Too little too late but Nathan Redmond has England's second goal of the tournament after a fine strike from 20-yards. Sweden have equalised against Portugal. Italy are going OUT! Their coach has his head in his hands. Italy are happy to allow England possession. But the Young Lions are struggling to string passes together as they have all game. It's all so disappointing. Final three minutes. Are England going out in a blaze of glory? No chance. Will Jackson: I have about as much hope for England scoring as I did when Ali Dia played for Southampton. Hopeless. G S Webster: How to sum up England's performance? Clueless and defensively naive. Summer holiday time, boys. Richard Smalley: England's footballers would gain experience if they played abroad for a couple of years and play outside their comfort zone. "You can say it is nowhere near England's best side. Look at the team they put out. Do they want to win the competition or use it as a way to bring players into the senior team?" Big noise in the Androv Stadium. Portugal have scored against Sweden. Italy are going through and the Azzurri boss Luigi Di Biagio has just passed on the message to his players. Cries of "Italia, Italia" ring out. "England were good enough to beat Sweden but they have been second best tonight." It's so flat in the Andruv Stadium. Even Italy's players have a look of rejection on their faces. They are heading out as well because it's goalless between Portugal and Sweden. John Wells: Maybe these Under-21 players and senior players should watch the England's women at the World Cup and see how it's done. Arthur Wilson: Oh my. Just like the full national side, these youngsters are an embarrassment. No technique, no awareness and no tactics. "There are quite a few Championship players in this England side and they are showing they are Championship players. "Harry Kane has been head and shoulders above any of the other players tonight." Harry Kane's angry. He lets fly from 20-yards but his shot is well wide. It's not been his tournament. Stu: Time to get rid of Gareth Southgate and replace him with Glenn Hoddle. At least he would get the best out of these young players. Italy have been impressive but they're still heading out - unless Portugal score against Sweden. It remains goalless as that game enters the closing stages. "It is just too easy for Italy." Time to start the engines on England's team plane. More dreadful defending as a free header by Marco Benassi beats Jack Butland from 10-yards out. It followed a clever hook by Marcello Trotta after a throw-in. Gareth Southgate looks miserable. So he should. England are going out. "England have to push on and take a few chances. They have lost a bit of discipline on the wide areas. They need to stand on the touchline and make the space a bit bigger. They keep coming inside and it is too congested." Darren Ward: Plenty of time. One goal and the game will change. Have some belief. People are so negative. Sachin Sadier: England have created too many half chances while Italy have created and converted two proper chances. Tez: Absolutely no composure under pressure. I can't believe England were one of the favourites for the competition. Twenty minutes left. Both England and Italy are heading out. Italy, despite leading, need Sweden to lose to Portugal in the other group game. It's still goalless. Not the impact Gareth Southgate wanted from Ruben Loftus-Cheek as the substitute is booked for a foul on Danilo Cataldi. It was his creativity he was sent on for. Not yellow cards. Unlucky Jesse Lingard. The Manchester United man tries to pick his spot from the edge of the area but the ball fizzes just wide of the post. "John Stones is not alone out there but the normally majestic Everton defender has not had an evening to remember. Normally so assured and commanding the ball has been like a slippery bar of soap every time it has come his way. The crowd are starting to get a little more excited. Not because of what is happening on the field. But because it is Mexican wave time. Italy will be very happy with that." Are Italy shutting up shop? Domenico Berardi, who has been a real threat, is replaced by defender Stefano Sabelli. And there's an England change too. Chelsea winger Ruben Loftus-Cheek is on for Jake Forster-Caskey. Another England chance, another let off for Italy. Nathan Redmond delivers a curling free-kick into the Italian area, Danny Ings flicks it on and Harry Kane, steaming in at the back post, is unable to divert it home while under pressure from Alessio Romagnoli. Raymond RT3 Tolulope: Same old story....hype, money, glamour YES. Quality and technical ability NO. Harry Redknapp is right, Rio Ferdinand is right. Shah Iftekhar: This always happens to England at major tournaments, don't understand why people keep getting hyped up. Gambeanö Snitch: If it ain't broke don't fix it. Isn't that the saying? Clearly Gareth Southgate doesn't see anything broken with starting 11. Corner to England after Harry Kane's shot is deflected behind. In it comes. Within seconds it's back with Jack Butland at the other end. Sadly, it's turning out to be the story of the night. "Danny Ings will be really disappointed with his first touch this evening, because the ball just keeps coming off him." There's a decent sprinkling of England fans in the Androv Stadium. Hardly any noise coming from them. That's not really surprising as their team has given them little to shout about. Big opportunities for Danny Ings, Nathan Redmond and Jesse Lingard in this game. England can't say they haven't had chances. Their lack of composure looks set to cost them. Alan Vaughan: Mark Lawrenson is right, Loftus-Cheek should be in the team, changed the game when he came on against Sweden just by his presence. Roger Curlett: As it stands Portugal top the group and we are bottom - both having scored one goal each. Difference is Portugal haven't conceded. Jesse Lingard is the only England player to score at this tournament and he goes so, so close to getting another. Great trickery by the Manchester United youngster inside the Italian area but his finish swerves just wide. "They have not changed personnel. Quite a few England players need to improve, they have to take a few chances now." Surprisingly, no changes by Gareth Southgate at the start of the second half. How long does he leave it like this before he sends on the likes of Jamie Ward-Prowse and Ruben Loftus-Cheek? England need goals. And quickly. We're back under way. "I'd replace Forster-Caskey with Loftus-Cheek"
"England's players passing the ball to each other in the second half would be a good start. I would bring Ruben Loftus-Cheek on, he has presence and physicality to make something happen, and take off Jake Forster-Caskey." Pete Roach: I've seen more forward passes at a rugby match. Daniel Kelly: Harry Kane is so greedy, tries too much! Awful from England, I guess at whatever level, we'll never learn how to defend. G S Webster: Time to make your mark Mr Kane and Mr Ings. Prove your worth. It's goalless at half-time between Portugal and Sweden in Group B's other game. So what does that mean to the table? As it stands, it is Portugal and Sweden who will be advancing. England need at least two goals to stand a chance of going through. On Tuesday, Denmark and Germany booked their place in the last four from Group A. "England playing straight into Italy's hands"
"The Italians are very streetwise. They reacted very quickly when England gave the free-kick away to score the first and then caught England when they were vulnerable in the wake of the first goal. "England are getting desperate, playing Hollywood balls, and that is playing straight into Italy's hands." Luke Dady: The Under-21s left out Jamie Ward-Prowse and Will Hughes. They need to bring on both, plus Benik Afobe for the second half. Alan Vaughan: As always we heap pressure on the players who the manager picks. Unfortunately he has picked the wrong team. Johnny Magrinho: Too much money + too much hype + agents scoring these kids the best deal = young players who don't care. So careless by England. They've left themselves with a mountain to climb. "The Italian left-back Cristiano Biraghi got back in there to clear the loose ball after Harry Kane's long-range shot was spilled. Why wasn't Jesse Lingard in there trying to get a decisive touch? Because he was on his heels." That's more like it. Half-time is fast approaching and England are enjoying their best spell of the match. It's as though they've suddenly realised they're in an awful lot of trouble. Harry Kane tries his luck from distance and it produces a flying stop from Italy's young keeper. But it was a comfortable save for the stopper than spectacular. Let off for England as Inter Milan's Cristiano Biraghi skies a great chance to put the game out of sight from inside the area. The Young Lions respond through Nathan Redmond whose trickery inside the Italian penalty area creates an opening but the Norwich player is denied by the boot of keeper Francesco Bardi. "I think that the many neutrals in here are thinking 'game over' already. The atmosphere has certainly gone rather flat." More frustration for Harry Kane as he has a shot from the edge of the area charged down. Someone needs to tell England they're about to be eliminated. Their tempo is poor. No sense of urgency from them at this stage. Naveed Afzal: So much more quality in the England side and yet they're losing. It's the hope that kills you. Starting line-up was wrong. Jon Seller: Same old (young) England - criminal standing off for the second goal, duly punished. Dave Stanley: Not a clue why everyone is complaining. The U21 team are playing just like an England senior team, crumbling under the spotlight. "England look all over the place"
"Now comes the test. England, on two occasions, might have taken the lead but Italy hit back with an opportunist goal and another immediately after, and now England are going out. Gareth Southgate's team have to score twice or Italy will go through. They look all over the place at this stage and these Italians are not usually the best when it comes to letting goals in. It doesn't look great." Very little from England since falling 2-0 behind. Italy still require Sweden to lose to Portugal to make the semi-finals. As it stands, it's the Swedes joining Portugal in the semi-finals. Nathan Coleclough: England giving far too much ball away in midfield. Poor. No pressure on the ball. No tempo. No quality. Jarleth Eaton: Guess it will have to be England's women to provide the success. The defending was utterly shocking. Peter Collins: Ah well... so much for that. Perhaps our kids aren't as good as we thought. Two simple goals really. Not good enough. Remember England's bright start? It seems an awful long time ago. Gareth Southgate's side are on their way out of the tournament unless they score at least two goals. But it's easier said than done. Italy are in complete control. The roof has fallen in on England here. They concede a second goal in as many minutes as Lorenzo Crisetig advances to the edge of the box and the England defence stand off. Marco Bennasi has made an intelligent run between the lines and is picked out by his team-mate. Ben Gibson belatedly makes a challenge but only succeeds in deflecting Bennasi's careful shot past a wrong-footed Jack Butland. "Absolutely nobody moved in the England defence. It was the simplest ball in and both the central defenders were stood watching, but it was a superb finish on the slide by Andrea Belotti." Awful defending allows Andrea Belotti to slide in and score from close range after Domenico Berardi's excellent cross. St.John: How Danny Ings did not hit the target sums up England goal scoring ability. "Italy right-back Davide Zappacosta is picking the ball up and just driving forward as quick as he can at opposite number Luke Garbutt. "Jesse Lingard has to drop back in there and mark him. It is not an optional extra, it is part of the game!" Italy are sharp and dangerous around the England area. Davide Zappacosta's pass is deflected off Jesse Lingard and who is this sliding in? Andrea Belotti stretches out a leg in an attempt to divert the ball past Jack Butland but the Palermo forward is unable to make contact much to England's relief. Don Uorri: I hate siding with Arry, but he's right. Kids need to chase playing time rather than money early on, money will follow in time. Coming up to the 20 minute mark. As it stands England are going through to the semi-finals. An awful long way to go though. England haven't created too many clear cut chances at this tournament but Danny Ings knows he should have gobbled that one up. Will it come back to haunt Gareth Southgate's men? "Danny Ings was away and you have to hit the target from there, ideally going across the goalkeeper. It was a sensational pass from Harry Kane though." Huge chance for Danny Ings. Harry Kane releases the new Liverpool forward after decent play by Nathaniel Chalobah and Ings is clean through but his finish into the side netting is disappointing. Italy's players breathe a sigh of relief. Decent long rang attempt by Domenico Berardi, the young Juventus forward firing narrowly over from 25-yards which only just clears Jack Butland's bar. Italy's best effort so far. "John Stones - normally so composed - has given the ball away and is caught chasing, trying to make up for the error." Promising start by the Young Lions. They are pressing the Italians at every opportunity. Ben Gibson goes down in the area and there's a half-hearted appeal for a penalty. The referee isn't interested. "Plenty of England fans here but many of them spread out across the Andruv Stadium and for that reason, the noise isn't great. Flags from Sheffield United, Hull City, Nuneaton Borough, West Ham United, Spurs. There is even a Scotland flag. No prizes for guessing which side the Scots are on ... "
Nervy start by both teams to what is a high-stakes game. Nathaniel Chalobah tries to release Jesse Lingard but his pass is easily cut out. Then Nathan Redmond drills the ball across the Italian penalty area which Daniele Rugani slices behind for a corner. "It is very interesting that the Italians are the ones that are playing 4-4-2 while England are lining up 4-2-3-1. I think this formation is designed to get the most out of Harry Kane." A huge 90 minutes for England's Young Lions. We're under way. England XI: Butland, Jenkinson, Garbutt, Forster-Caskey, Stones, Gibson, Kane, Redmond, Chalobah, Ings, Lingard. Italy XI: Bardi, Biraghi, Crisetig, Rugani, Romagnoli, Belotti, Berardi, Benassi, Trotta, Cataldi, Zappacosta. "Kane has been head and shoulders above the rest"
"If you are one of the younger members of the team you look around the dressing room and see Harry Kane and think 'we are going to be alright here'. "He is a very level-headed guy, but he knows he is good and he has been head and shoulders above the rest of what England have got really. "He has not scored but he has occupied defenders and made the few chances he has had on his own." Out come the teams into the evening sunshine in Olomouc. Italy's players are clearly fired up as they belt out their national anthem. "England must move the ball quicker"
"England were a lot better against Portugal even though they lost that game. They moved the ball a lot quicker and the must do that against Italy. "Watching them at this tournament is a bit like watching the senior side - you never know quite what team is going to turn up, but they have got a chance of going through and that is all you can really ask for." Jake Forster-Caskey and Nathaniel Chalobah will sit deep, with Danny Ings expected to drop behind Harry Kane at times and form a three behind the striker with Jesse Lingard and Nathan Redmond. England manager Gareth Southgate on BT Sport: "Italy will press hard and will be tough. John Stones is an outstanding player, and brings a composure to us. The players have great faith and trust in him. "We have to prove ourselves in the next 90 minutes. Some of the pressure has been relieved by getting the win over Sweden. Now there is an opportunity for them to make a statement and give a very good performance." Alan Vaughan: We shouldn't forget that there are a number of Premier League Under-21 players who chose not to go this tournament or who were asked not to go! Howard Jones: I'm sure other football nations have the same issues. Harry Redknapp talks like it's only our lads in world football underachieving at clubs. After losing to Italy at the Euro Under-21 tournament in 2013 and last summer's World Cup in Brazil, England will be hoping there is no repeat in Olomouc. Can England change their fortunes in front of goal? Gazza's tears, 1966, Michael Owen's hat-trick in Munich, Frank Lampard's 'goal'...England against Germany games have provided England fans with bitter-sweet memories down the years. Should the Young Lions finish top of Group B then they will face the Germans in Olomouc on Saturday. Finish second and it's over to Prague for a semi-final against Denmark. Ryan, Brighton, on text: As a Brighton fan, happy Jake Forster-Caskey is starting but you ask any Seagulls fan and they will be puzzled why he was selected in the squad ahead of our 6'3 colossus Rohan Ince. He has been great over the last two seasons and far better than JFC a game changer. Want to know the secret behind England's tournament-reviving win over Sweden? Was it Gareth Southgate's spot-on tactics? Perhaps the influential presence of Harry Kane? Not according to defender Ben Gibson. The Middlesbrough player says a round of crazy golf was responsibly for saving England's campaign. "There is a crazy golf course just around the corner from out hotel,"
said Gibson. "We arranged a mini tournament for the lads and it put everyone in good spirits again. Next day we beat Sweden and I think the crazy golf has a big impact on that game." Now his tournament has been cut short by injury, is Alex Pritchard ringing for a taxi home? The Tottenham winger's tournament might be over but the 22-year-old is staying on in the Czech Republic to support his England team-mates after suffering ankle ligament damage in the win over Sweden. "He is keen to stay out here and some of his family are here too," said England boss Gareth Southgate. Arthur Wilson: What does Loftus-Cheek have to do to earn a start? Southgate doing a Hodgson with his team selections. Theo Resnikoff: Surely Harry Redknapp wouldn't be saying that about Kane if he was still at Spurs or England manager for that matter. Resentful. "Big night for Jake Forster-Caskey. Gareth Southgate right to keep faith with Liverpool striker Danny Ings, who starts just behind Harry Kane." "I think the consensus of opinion is Chalabah and Forster-Caskey are the best sitters. You are almost saying score your goals through the front four. You can see the sense in the selection and John Stones back is a key thing. "All three games have been different. " The 21-year-old Brighton midfielder - who is the son of former Reading and Notts County midfielder Darren Caskey and the stepson of former Reading and Brighton striker Nicky Forster - has an impressive record for England Under-21s. He has won eight of the nine games he has played in for the team. He made 33 appearances for Brighton last season, scoring three goals. Sweden 1-0 on Sunday. Manchester United's Jesse Lingard replaced Tottenham midfielder Alex Pritchard after 55 minutes and scored England's late winner. "It was just a massive relief for everyone in the camp. The team spirit and togetherness of our squad is really good and we are going into the Italy game fully focused," said Lingard. Italy also put in an improved display after defeat by Sweden as they pushed Portugal all the way in a 0-0 draw. But it's win or bust for the Italians tonight. Will the sun shine on the Young Lions? Both sets of players are out on the pitch at the Andruv Stadium in Olomouc going through their pre-match routines. It's a glorious night in the Olomouc, situated in the east of the Czech Republic. "I'm very disappointed England have not created more"
"I have been very disappointed with the amount of chances England have created. Harry Kane is a very good player but England have not managed to create enough chances for him or get enough players around him in the last third - the dangerous areas." Why have all the goals dried up? 5-0 victories. In total, the Young Lions scored 31 times in 10 games on their way to the Czech Republic. Yet they have managed just one goal in two games this tournament. "We've got to look at have we created enough clear-cut openings," said Young Lions boss Gareth Southgate. "We have got to make sure the service is right, got to make sure that although we want to dominate progression and dictate games that we're not toothless at the end of it." The last Italy Under-21 team to lose to England had goalkeeper Gianluigi Buffon and forward Francesco Totti in the side. Elton John was at the top of the UK singles charts with Candle In The Wind and Wimbledon, Barnsley and Sheffield Wednesday were in the top-flight. Kieron Dyer scoring the only goal. Former Liverpool defender Mark Lawrenson is in the Andruv Stadium in Olomouc as part of BBC Radio 5 live's commentary team. There is full match commentary with 5 live's senior football reporter Ian Dennis, and Alastair Yeomans from 19:45 BST. Build-up starts at 19:00 BST. criticised England Under-21 players saying they "think they have made it". "Half of them play in the Championship, half can't get a game," he said. "The centre half, one of them can't get into Leicester's team. These guys need to play." Is Redknapp right? And have any of Gareth Southgate's Class of 2015 got any chance of becoming established senior England players...and why? "The England team is confirmed and it is the expected return of John Stones that will give England fans a lift. His assurance and control at the heart of the defence has been such a feature of this side's success. Danny Ings keeps his place after a good second half performance against Sweden. "The surprise is the inclusion of Jake Forster-Caskey who comes into the side for Will Hughes. Big gamble for a player who hasn't played a minute of this tournament, but Gareth Southgate has great faith in a player who was a key part of the team that got England here." Subs: Ward-Prowse, Carroll, Bond, Bettinelli, Keane, Hughes, Afobe, Moore, Chambers, Targett, Loftus-Cheek. Four changes for England from the side that started against Sweden on Sunday. Everton defender John Stones starts as does Brighton midfielder Jake Forster-Caskey. Also back is Liverpool striker Danny Ings and Manchester United winger Jesse Lingard. England's campaign to qualify for Euro 2015 began way back in September 2013 at Reading's Madejski Stadium. While a win will take them through to the semi-finals, defeat will spell the end of their interest in the competition. A draw will be enough so long as Sweden fail to beat Portugal in the other match in Group B which also starts at 19:45 BST. Italy will go through only if they beat England and Sweden lost to Portugal. 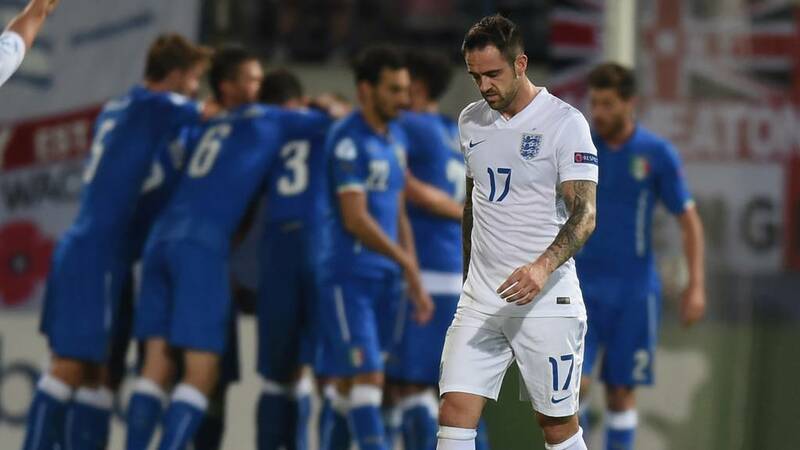 It's two years since England's Young Lions set the tone for a wretched European Under-21 tournament by losing to Italy in Israel. One year since Mario Balotelli's headed winner for the Azzurri set the tone for a dreadful World Cup campaign by Roy Hodgson's senior team. But cheer up England fans. Defeat Italy tonight and England are in the Euro Under-21 Championship semi-finals. Can Gareth Southgate's Class of 2015 do what the seniors have not done for so long...and win a tournament?